Prelude To Paris...Just Not With A Kiss » I Mean…What?!? The incredibly colorful Milan Fashion Week came to a close with a stunning collection from Giorgio Armani, a symphony in navy blue. There is much optimism in the air, buyers are heralding the return of the 70’s, hippies that are beyond chic, new shapes that are fresh and flowing and color, color everywhere. Except at Dolce & Gabbana, where white was the main attraction, similar to the many collections shown in New York. As anticipation runs high for Paris Fashion Week, I found a couple of presentations that surely will NOT foreshadow The New Look from Paris. On the contrary, somehow these duds-makers (a term that pretty much sums it all up, you’ll see) decided to show early for fear of getting lost in the sauce. They are lost all right. Maybe not in the sauce, as much as having lost…it. Finally, couture for the breast-feeding mommy. Thank you Aganovich. Liz Lange is gonna knock this look off for her Target maternity collection. 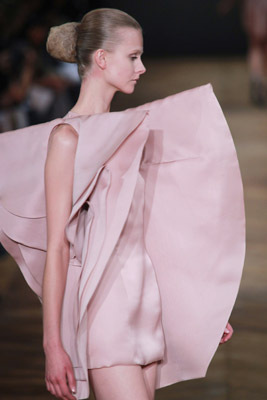 Not sure what this look is...perhaps designer Aganovich was inspired by his childhood, cotton candy, to be exact. 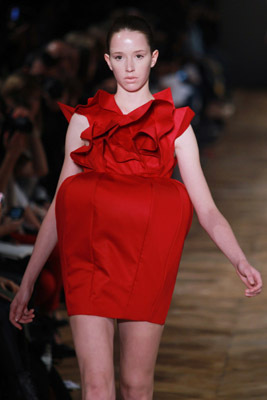 Amaya Arzuaga showed a few looks make it hard to walk into a room...that is unless you go sideways. Though that might not apply here with this look. Try dancing cheek to cheek in this nonsense. This dress is very youthful. Why? Because these over-sized folds to draw attention away from your labial folds. How's this for a flattering silhouette. I don;'t think Lagerfeld or Galliano have much to worry about. The competition is NOT fierce. Follow I MEAN…WHAT?!? on Facebook, too. Well, well. Woman with book Picasso, 1932. Worked as a painting, but not here.